1963 groing Leif Hermansson interest in Japanish Martial Arts up but there were only judo and jujitsu at the time in Turku, Finland, where he was born. 1969 they opened a karate division at the Judo Academy in Turku there he was active and he could now begin also karate training. His interest in karate, however, was much larger than anything else, and after a while he left off with judo to be able to train more karate. 1970, he was also begin to instruct in karate in his judoclub and 1972 sent the judoclub him to the very first course for instructors as Finnish Karatefederation arranged. 1973-1975 he worked as military in Turku and Pori, and was made responsible for close protection training for military, and 1974 he was elected to the board of Finnish Karatefederation. 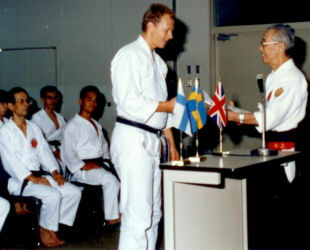 Leif Hermansson was now instructing several groups of the week, and he also started the new karateclubs in south-western Finland as Salon Viesti Samurai in Salo 50 km east of Turku where he became both the instructor and chairman 1975-1976. 1976 he started and named Shaolin the chool of Martial Arts in Turku there he where the instructor, together with Ilpo Jalamo. He also where the first chairman of Shaolin until 1978 when sensei Hermansson moved to Sweden. His first martial arts club in Sweden, Budoclub Keiko he started in Katrineholm and then started to spread bujutsu with Yuishinkai karatejutsu and Okinawa kobudo by starting several martial arts club in various locations as Nykoping, Orebro, Flen, Eskilstuna, Kumla, Falkoping, Stockholm, Taby, Vaxholm, Vallentuna and Akersberga. 1979 began he also kenjutsu in which, above all, iaido became an important part of his life when he oscillated from Katrineholm to Vällingby 2 times a week for a couple-hour training in 2 years time! It took all evening and half the night before he was at home again in Katrineholm and would then be up and working at 7 in the morning! In those days there were not so much opportunities for training with samurai sword in Sweden, but if you want to learn there is no distance (360 km) for long! After 2 years, however, he had learned so much that he could start an iaido division in his karateclub, begin to teach himself also in iaido, and take there a instructor (Mikael Bornholm) once a month. In the early 80's became Hermansson then a student of Komaki-sensei, 7 dan renshi in iaido, after to have seen his impressive iaido show in a karate competition in Stockholm. In the early 90s he trained iaido and also jodo under sensei Ishido Shizufumi, 8 dan hanshi together with Takao Momiyama, Istvan Gubas and Rolf Radakovits and in 1999 he meet an iaido-sensei with the name Hiroshi Nishihira, 8 dan kyoshi in Okinawa and could now also train iaido during his trips to Okinawa. After few years sensei Nishihira returned and did not teach any more and actually died short after that. At the same building Okinawa Prefectural Budokan, soke Hermansson saw an other iaido master train in the 1st floor with name soke Hamamoto Hisao and he now continue his iaido train with Hamamoto sensei in Mugairyu and Hachimanryu iaido and Battojutsu. "I started to go to Inoue Motokatsu sensei in Japan almost every year in the late 70's, sometimes made it 2 times a year. Stayed from a few weeks to several months, as long as the money was enough, and trained privately with him several hours each afternoon. Since I was of course in his dojo when he taught his students in the regular classes, in the morning and evening classes. It became 8-10 hours of training 6 days a week! Inoue Motokatsu Sensei get always up at 5 in the morning and started to train for himself. Then, I heard when I woke up that he began to throw shuriken (sharp arrows) of a target or rattle with his weapons. I was asleep, often in the Dojo and his house was side by side with the Dojo. In his house, he had a small private Dojo, where he trained himself. I get usually up at 6, and ran up to the high mountains that rise up to heaven just behind the Dojo. The mountain is covered with dense jungle-like vegetation, and mandarin threes, and the road was winding up. A look that closely winds and a snake across the road in front of me. They were not very big, only 1-2 meters, blue, green and brown, and I began to accustom myself to them until by chance I once heard someone say that I would look up with the brown one, which could be dangerous! Each morning, I ran up the mountain on one side and down the other side, it took me about 40 minutes. After that I went into the Dojo again and began to stretch and to the breakfast before the morgnings class began at 9. The training was over at 11 and after lunch I began my private training with Sensei Inoue. The lesson on the evening with the other students at the dojo was between 19 and 21 and after that we all went out together to eat and relax and talk about the sovereign workouts, and if our incredible teacher. It was a very nice atmosphere and everyone was friendly and happy and helped me a lot with my training. Especially shihan Kawasaki, which was one of the shihans at the dojo and that of Inoue Sensei ordered to constantly stand beside me and be my personal trainer from the very first day. We trained a lot of Kata (form) in which bunkai (applications) is the most important part of training in Inoue Motokatsu senseis Yuishinkan karatejutsu. We also trained exercises such as different take downs, restraint and locks, low kicks and defense against knife attacs etc. Technologies that are effective in the street, but that does not fit for competition. Training with the weapons (Ryukyu kobudo / kobujutsu) took a very long time and is an important part of the system. The most karatemasters trained with the different kobudo weapons such as BO, SAI or TONFA, because they had understood that they could do better in their own karate if they completed their training with weapons. Inoue Motokatsu-sensei said often that we must understand the meaning of these technologies, and if we are attacked, we should defend ourselves without arms only if there is anything at all in our neighbourhood which can be used as weapons. Important was also that if we defend ourselves with weapons, we must be able to handle them. By Kobujutsu training we learn to use various objects that are available (such as handbag, belt, umbrella or almost anything) to defend ourselves in a more efficient way! Inoue Motokatsu -sensei often compared the principles of his karate with water flowing down a mountain. When the water meets resistance such as a stone, round the stone and find new ways all the time, past the opposition if it can not move the stone. With that, he meant that we have to be flexible and able to adapt the defence all the time after opposition and the situation can change at any time. The basic idea is to use the movements and parades to come off the attackers line in a more sheltered position, and from there attacking his vulnerable and sensitive body parts with the nerve (kyusho jitsu / Tuite / dim mak). The techniques are very simple and natural, and anyone can learn this when no acrobatic exercises type high kicks or volts is present. It is simple and effective technologies, and if a technology fails, it must be able to gently move to the next. Several techniques in a flow, until a consensus is down, or that he gives up. The techniques will always float without interruption, either in thought or action. Therefore, use parts of different system in combination with each other in which this philosophy is that a red line across the teaching. This makes that Inoues Motokatsu-senseis karate karatejutsu is perfect for example, girls, when you do not need big muscles, or the stewards, police, bodyguards and soldiers when the techniques are realistic and efficient and can adapt to different situations. Inoues godfather Fujita-sensei was, of course, professional bodyguard, and this has influenced his teaching! Inoue-sensei would never disclose his style too much. He wanted instead to keep the almost familial relationship, which he had for his students. He learned, therefore, to know the students well and became something of a kultfigur for us, and the subject of our boundless respect and love. It was difficult for a novice to become a student of him and it could go 5 years without a single new pupil was approved, but once it was with were on hand at a personal and humble way. His kindness, warmth, patience and understanding of the students when he taught was an almost unique and, unfortunately, quite unfamiliar concept in many of the other major Japanese karatemasters when they taught their students, especially in the case of foreign students. Inoue-sensei was both able and willing to share his knowledge and he was always very fair. To train Martial Arts should be a way of life, so be it anyway for Inoue-sensei "never stop practicing". Motokatsu Inoue changed his way of interpreting his first name Motokatsu at budo connection to Gansho 1988. At the same time changing even his son Takakatsu Inoue his first name to Kisho. Suddenly became Inoue-sensei old and sick. He cunnot train so much anymore but we tried to work even harder. The time catch up with us anyway, we can not change fate, we all become old at some point and die. It is the inevitable. I may be happy that I still had so many years with my sensei. Inoue-sensei died of cancer on January 1, 1993 in Tokyo and he was 74 years old. According to Japanese customs, he appointed his son Kisho Inoue to his successor, to lead the organisation Ryukyu Kobujutsu Hozon Shinko Kai and style of Bujutsu called Yuishinkai. Motokatsu Inoue was one of the last great masters, and he was much more than just a teacher to me, he was also my piritual father. The organization was never the same after his death, and in 2001 I left the organization due to some people, who were interested in power and had destroyed the entire fine familial atmosphere inthe style. The organization had in recent years marked by internal infighting, power struggles and intrigues, and I had no future in this organization any longer. I joined the other, larger organizations, instead, to continue to develop my karate and kobudo, primarily through new contacts on the island of Okinawa, birthplace of karate and kobudo. " Together with some of the greatest masters of Okinawa, has soke Hermansson then innovated WTMAS - World Traditional Martial Arts Society, that is a worldwide association to develop and preserve traditional Martial Arts from Okinawa! To train Martial Arts - bujutsu is enough for a lifetime. You will never be finished when you can develop all the time. The human body has its limits which will be reminded of different ways especially when you get older, but for the development of your soul (kokoro)and mind, there are no borders! In July 2007 did soke Hermansson his 31st trip to Japan and Okinawa, this time with 8 of his students from Sweden for 3 weeks of intensive training. At the end of July, he became then graduated to 10 dan hanshi in both karatejutsu and kobujutsu, the very highest level that can be achieved in the various Martial Arts! There are only 2 people in the whole world that has such high degrees and one of them are living in Okinawa and the other one now in Sweden! Hokama Tetsuhiro Sensei, 10 dan hanshi, one of the most well-known karate and kobudo masters in Okinawa, also gave him the permit to start his own style and named the style to Shunahaku after the 3 branches of karate in Okinawa; Shuri (Shu), Naha (Na) and Tomari(Haku), where Hermansson downloaded his knowledge from. It is never too late to start exercising, but always to early to give up! After more than 50 years of training and the last 30 years mostly in Japan and Okinawa is soke Hermansson a very qualitative teacher in karate and especial Okinawa kobudo. Sensei Hermansson started his training of Martial Arts (judo and jujitsu) 1963 in Turku, Finland there he was born. Became karate instructor (Wadoryu) 1971 and also teach Finish police department and military (special unit) in close combat when he worked as military officer (sergeant) in Finnish army 1973-1975. 1974-1975 the karate-ka in Finland elected him to member of the board in Finnish Karate Federation. He also started 3 dojos in South-West part of Finland 1972-1974. Become the founder, president and instructor of Shaolin - Academy of Martial Arts 1976 in Turku, Finland. This dojo stil exist at the same place and runs now by the collagua and friend of soke Hermansson, sensei Ilpo Jalamo. Started his training in Brazilian jiujitsu 1996 in Rio de Janeiro, Brazil, by to become a student of the world champion Alexandre Paiva. After that his mentor and sensei Inoue hanshi died 1993, sensei Hermansson went to Okinawa for training with some other masters like hanshi Akamine (Shorinryu karate and Ryukyu kobudo), hanshi Hokama (Okinawa Gojuryu karate and Matayoshi kobudo) and hanshi Nakamoto (Shorinryu karate and Ryukyu kobudo). Sensei Hermansson travel to teach Martial Arts in many countries like Japan, South-Africa, UK, French, Holland, Austria, Belgian, German, Russia, Italy, Finland, Norwegia, Republic of Moldova, Kazakstan, Poland and USA. 2003 he trained the Swedish national bodyguard team to the world champion. 2005 sensei Hermansson gets his Soke tittle from Jiujitsu International signed by soke Yasumoto, 10 dan, soke Morris, 10 dan and soke Karlsson 9 dan. Nominated to The Instructor of The Year by Swedish Budo & Martial Arts Federation in March 2007. Awarded to Hall of Fame 2007 for Golden Life Achievement by WTKA, World Traditional Karate Association. In July 2007 he made his 31st trip to Japan and Okinawa, this time for 3 weeks training together with 8 of his students from Sweden. 28 of July he get his 10th dan diploma in both karate and Okinawa kobudo. President of WTMAS (the World Traditional Martial Arts Society) The Society for Promotion and Preservation of Traditional Martial Arts from Okinawa. Head master of Kaizenkai Bujutsu Academy in Sweden. DO YOU LIKE TO ARRANGE A SEMINAR WITH SOKE LEIF HERMANSSON? We teach all over the world Okinawa Martial arts as karatejutsu and kobujutsu but also iaido and self defence for women etc. We teach very popular special training courses like in bodyguarding and close protection for police & security officers, and people in various occupations such as: chauffeurs, clerks, social-workers and staff on a cruise ships, airplanes, in correctional facilities, hospitals etc. Please, don´t hesitate to take contact with us to plan one of your best seminars never ever! Sensei Leif Hermansson is one of the few Westerners who had to train with the legendary Motokatsu Inoue-sensei in Japan for a longer period.